A new coagulant, based on rare earth elements, now makes it possible for wastewater treatment plants to achieve ultra-low phosphorus targets—as low as 0.07 mg/L—without adding or upgrading tertiary filtration equipment. 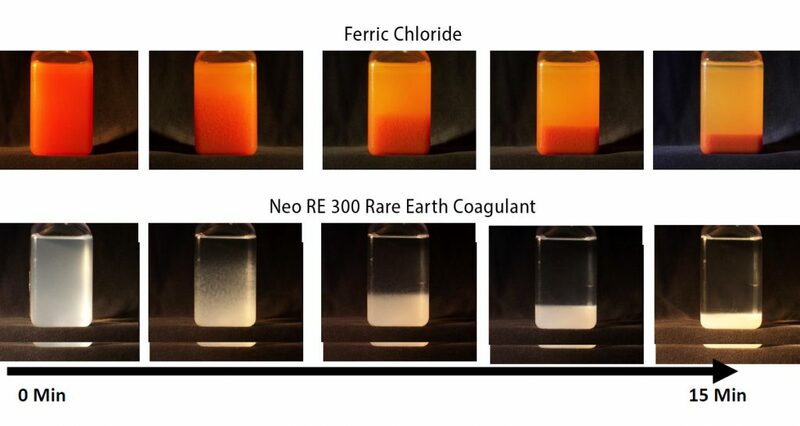 Neo RE300 rare earth coagulant reacts quickly with phosphorus to form a dense precipitate that readily settles out of solution within minutes. Neo RE300 rare earth coagulant can easily replace conventional coagulants to dramatically improve chemical precipitation of phosphorus in treated wastewater effluent. The rare earth elements in RE300 enable the coagulant to form a strong, crystalline bond with phosphorus and produce a denser, more stable precipitate than conventional coagulants such as ferric sulfate. This dense precipitate settles quickly in clarifiers and is the primary reason that wastewater plants using RE300 can achieve ultra-low phosphorus in treated effluent without the use of filtration equipment. Safer for operators; rated non-hazardous. More than 50 plants in the US already use Neo RE300 to meet stringent phosphorus discharge requirements, improve clarifier performance and reduce sludge storage, dewatering and disposal costs. Eliminate need to add large chemical storage tanks, tertiary filtration equipment or buildings. Contact us today to learn how simple it is to switch your phosphorus reduction chemicals to Neo RE300 and easily meet stringent phosphorus targets without costly filtration equipment. Read more about RE300 for phosphorus removal here.